We Discover Canada And Beyond: Baja Bound, Part 26. Los Barriles, Baja Sur. November 21st to 23rd Visiting Catherine and Lorne in Los Barriles. 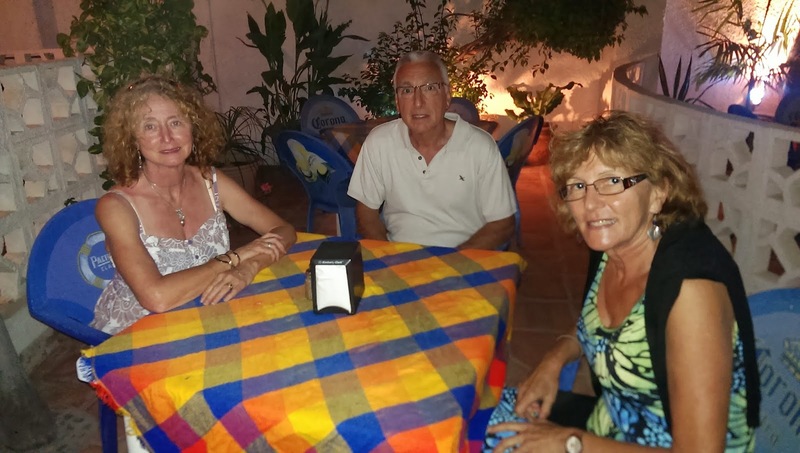 Friends from Victoria, Catherine and Lorne invited us to stay with them in Los Barriles. They just built a beautiful home in the Las Brisa's area on a hill overlooking the town and the ocean. It was so nice to see them both. They looked so relaxed and happy. They arrived from Canada not too long ago. They will stay here all winter to enjoy the sunny lifestyle. Unfortunately Anders stomach was not well the first evening. He hardly ate any of the yummy BBQ steak or drank any wine. A sure sign that he was ill. I was fine and enjoyed every bit of it. The next morning Anders was a little better. Catherine and I met her friend Susan next morning, and we went on a hike. Susan and her dogs guided us up the mountain to the south of Los Barriles. Great hike and wonderful views back over the town and into the arroyo to the south and the distant mountains. Toward the evening we all went to the beach in town. We witnessed the release of about 350 tiny turtles. The mama turtles apparently just come up on the beach, lay their eggs, cover them with sand, and then swim away. The eggs will hatch in the warm sand by themselves. Unfortunately dune buggies, cars and animals damage plenty of these nests. A caring local couple rescues these turtle eggs from the beach by carefully looking for turtle tracks in the sand in the mornings. Then they put the eggs in a save fenced area on the beach until they are hatched. For the release, they racked the beach and then released the young turtles so they had to wobble about 20 feet down to the water before swimming away. Apparently these turtles will return as adults and will lay their eggs here on the same beach. Afterward we went for food at a local restaurant. There was also a fair in town. We walked through the displays and ate some desserts from the street vendors.